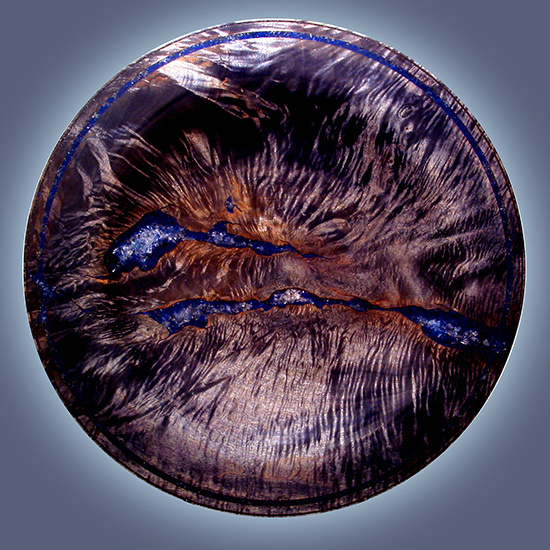 Materials: Extremely curly-figured bigleaf maple with inlaid Translucent minerals. Finished with metal-acid dyes and musical instrument lacquer. Comment: This piece literally exploded on the lathe when being rough turned due to a bark inclusion that soanned the piece. This inclusion was invisible when I started the rough turning. Normally such an accident would result in the piece being thrown-out but the wood was so extraordinary that I glued it back together, allowed it to fully dry (the wood was wet), then replaced the break and inclusions with mineral crystals and epoxy. When finished the piece was dramatic and gorgeous. Featured at the Temple Arts Festival, Nashville, TN and acquired by a local collector.